Gallery@Large, the new exhibition space for Arts@Large. Photos by Nickolas Nickolic. On Gallery Night, non-profit arts advocacy organization Arts@Large will host the Grand Opening of their brand new brick-and-mortar space in Walker’s Point. They are calling it Gallery@Large. Since 2001, Arts@ Large has been taking arts education in to the public schools of Milwaukee,working to fill the gap as schools and administrators are forced to cut funding for the arts. Arts@Large partners with 24 schools (in grades K-12) across the state, working strategically with teachers, students, artists and policy makers to create sustainable, long-term arts programs in public schools. Now Arts@Large will have a beautiful space of their own that will display works done by the students and the artists/educators they work with. Their debut exhibition is titled Mosaics: Faces of the Future. 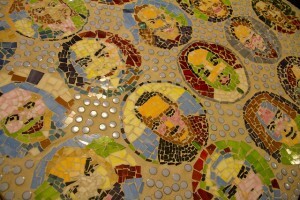 On Gallery Night, the space will be filled with mosaics created by students from the Keefe Avenue School, a K-8 school. Artist Leann Wooten has been working with students since the end of January to create nine large scale pieces. Students in grades 3-8 took photographs of each other then replicated those pictures using pieces of stained glass and tile, which they cut themselves. The result is six large (and very colorful) mosaics picturing twenty-five students in each. As part of the gallery’s grand opening, Arts@Large will be creating an interactive community mosaic on site throughout the event. Everyone who comes by is invited to place some tile and glass to create a piece that will represent the community of friends that Arts@Large has drawn together. This piece will become part of the permanent collection. Leann Wooten will also have a couple of her own pieces on display. The Keefe Avenue School mosaics will be on view until mid-May, at which point they will return to the school to be hung permanently. Over the next several months, Kagel Elementary School will start to use the Gallery@Large space to display a bookmaking project using the Aztec alphabet and led by artist Robin Kinney. Kagel will also have a night of Aztec and Native Mexican dance created with the students and choreographer Roberto Franco. 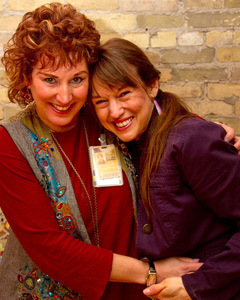 Executive Directors Kim Abler (left) and Teri Sullivan. 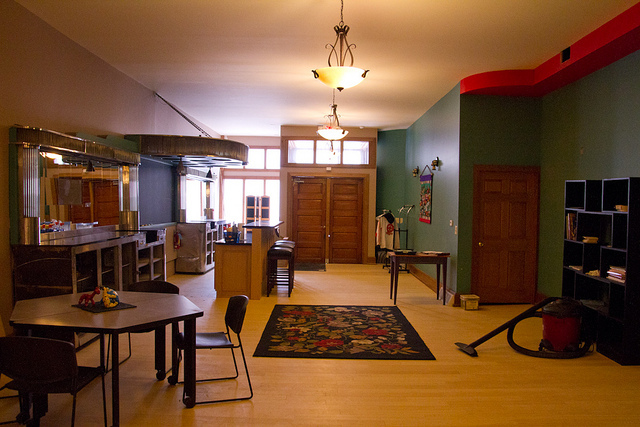 As it progresses, the space will create a home for the creative works of children throughout Milwaukee’s diverse population, and also for the many artists and educators that work with Arts@Large to bring a creative education to all the students in this city. Listen to my interview with Executive Directors Kim Abler and Teri Sullivan to learn more about Arts@Large and their commitment to arts education and student development. For more information about the Gallery Night event, click here. 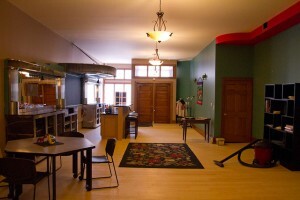 Gallery@Large is located at 908 S. 5th Street and is open for viewing on Gallery Night, April 15, from 4-9 p.m.